The end of the school year is fast approaching. Little man is already done with preschool. I only have two weeks left until his sister is out also. I am not sure if I am ready for both of them to be home all day yet. For now I will try to remain calm and enjoy the Memorial Day weekend coming up. We don't have definite plans, but there will be an ice cream social for our neighborhood that we may attend. 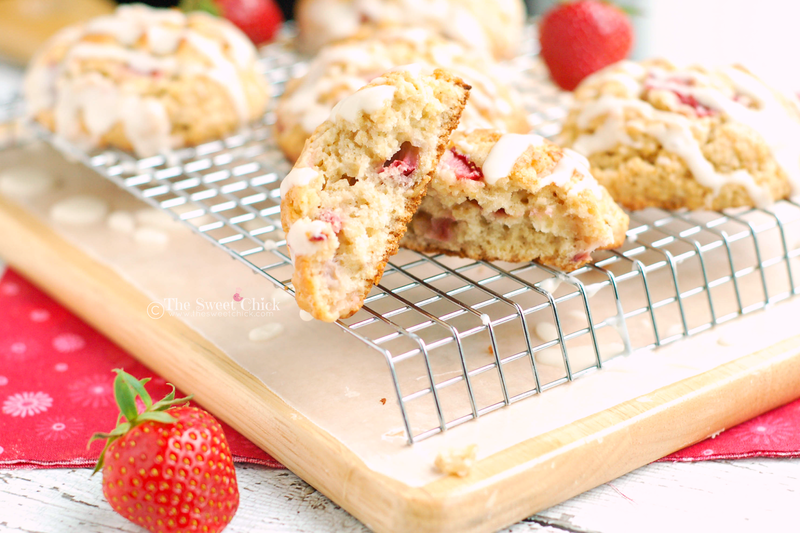 To kick it off right, I think I will pour myself a cup of coffee and bite into one of these Strawberries and Cream Scones. 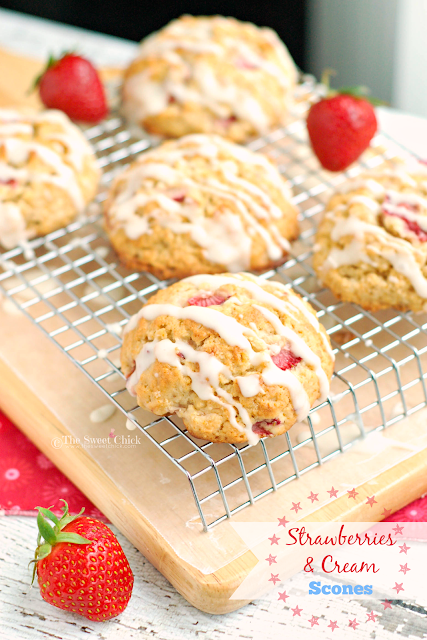 They are full of fresh strawberries, sweetened with honey, and drizzled with a creamy glaze. I used heavy cream in the scones as well as for the glaze. I added some honey for an extra bit of sweetness and rolled oats, because I love rolled oats. I mixed the chopped strawberries by hand so them wouldn't get all destroyed. There are a lot of strawberries in every bite. The scones came out a beautiful golden color sprinkled with dots of red. I just drizzled a little glaze on each scone. Just enough to add some sweet creaminess. I really love the taste of honey in these Strawberries and Cream Scones. It blends well with the heavy cream and the strawberries. 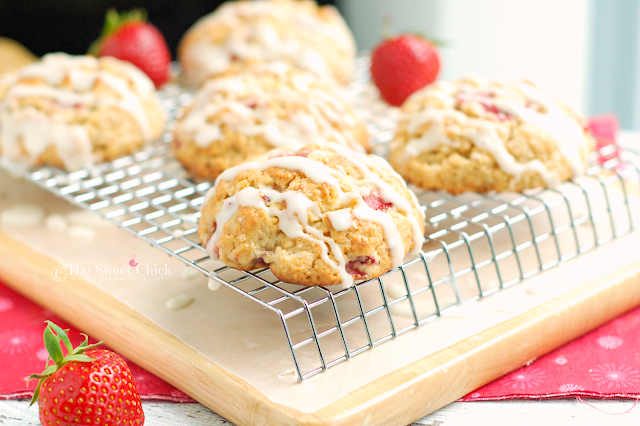 These scones are still wonderfully light and fluffy. They are perfect alone, or paired up with a glass of milk, a mug of coffee, or a cup of tea. I sent some to school with my daughter's lunch, because she really loved them. I think you should make some to start off your holiday weekend right also. 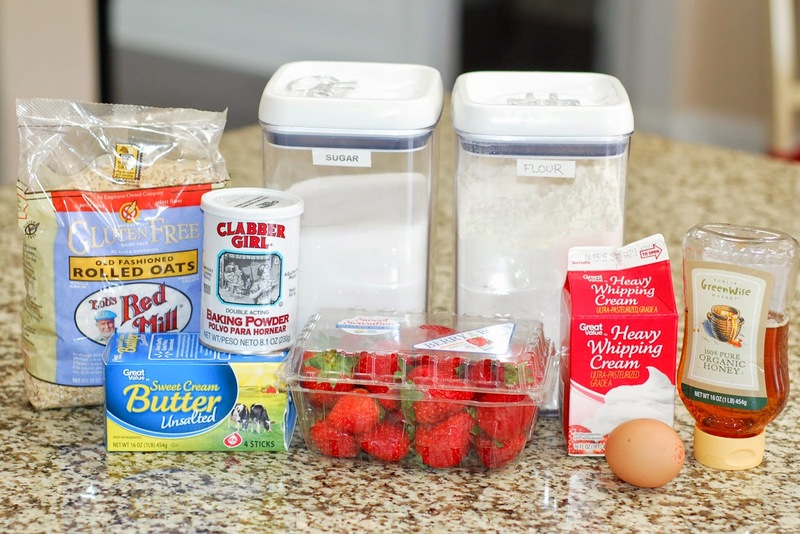 In a stand mixer, mix flour, sugar, baking powder, and oats. Cut up butter and add to flour mixture, mixing on low speed for 1 minute. In a small bowl beat egg, then add it to the flour mixture along with the heavy cream and mix until well combined. Next add honey and mix on low speed until fully incorporated. The batter will be a dough like consistency. 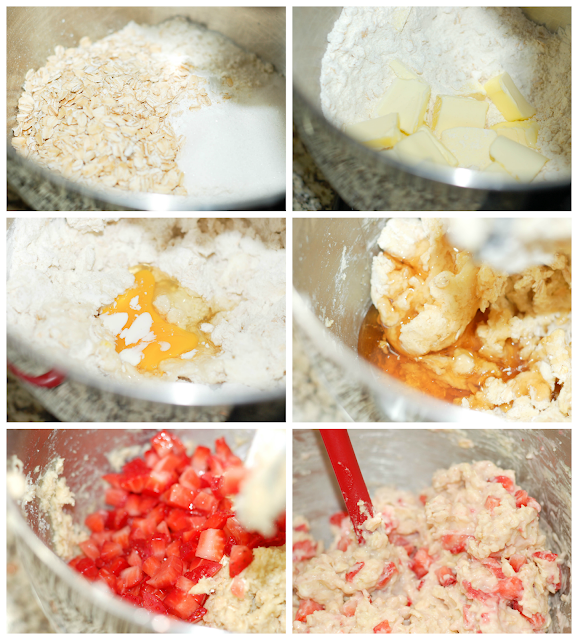 Lastly, add the strawberries and mix them in by hand until fully incorporated. With a large scoop, place dough onto a greased/parchment lined cookie sheet. Do not flatten. Bake at 425°F for 13-15 minutes or until a golden color. Remove from cookie sheet and place on cooling rack with wax paper underneath and allow to cool before glazing. 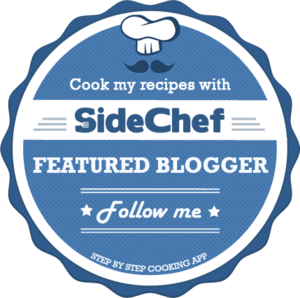 In a small bowl whisk together powdered sugar, heavy cream, milk, and vanilla until smooth. 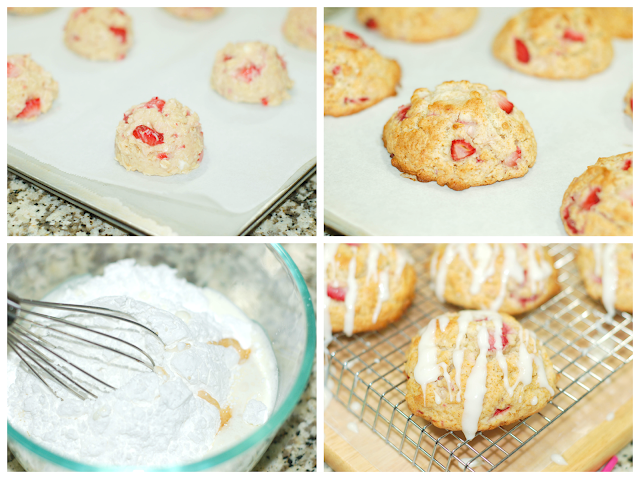 Using the whisk, drizzle the scones with as much or as little glaze as you prefer. You can wait for the glaze to set or go ahead and eat one!